Above is the stem-and-leaf display for a group of test scores. Order the mean, the median, and the mode of the scores from least to greatest. The scores represented can be found from matching the tens digits in the "stem" to the units digits that form the "leaves" in their row. 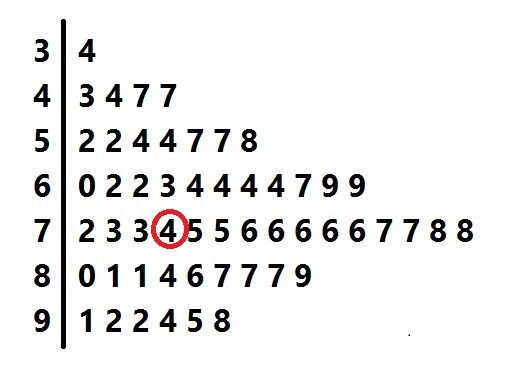 For example, the "leaves" in the "5" row are "2 2 4 4 7 7 8", so the scores will be 52, 52, 54, 54, 57, 57, and 58. As can be seen in this diagram, the score - the median - is 74. The most frequently occurring "leaf" is the "6" in the "7" row, so the mode is 76. In ascending order, the values are mean, median, mode. To find the mean, add up all the terms and divide by the total number of terms. We have 9 terms, so our denominator will be 9. Find the mode of the data set. The mode of a data set is the data point(s) that appear the most often. In the data set for this problem, both 4 and 5 appear twice, and no other number appears more than twice. So for this data set there are two modes, 4 and 5. The mean is the average of all the number in the data set. The mean is the average of all the numbers given. Add all the numbers and divide the total by five. The mean is the average of all numbers in the data set. Add the numbers, and divide the total sum by four, since there are four numbers. The mean is the average of the numbers provided. Sum the numbers and divide the sum by three. Next, identify the median by identifying the middle term. So, our median is 67. Order the numbers from least to greatest. The median of a even set of numbers is the average of the central two numbers. The numbers provided are already in chronological order. Since we have an even set of numbers, the median of the numbers is the average of the two central numbers. Do not confuse the meaning of mean and median! Geneva College, Bachelor of Science, Mathematics Teacher Education.